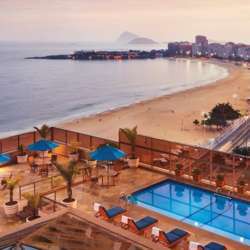 InterNations Rooftop Fun Event @Marriott Copacabana! What about having a good time on a Friday night? And this in a singular place while waching the ocean? Let's socialize and have fun at Moon Lounge, the charming bar on the rooftop of the 5 stars Marriott Hotel, owner of one of the best views in the marvelous city, Copacabana Beach! Yes, you can dance! Marriott's resident DJ will be in the command of the music, firing up our night! Once there, besides the gorgeous view in front of us, we can also enjoy the snacks of the peculiar food truck Marriott has over there (legend has it that it was lifted by a helicopter), as well as the high quality drinks served at their pool bar. **There'll also be a raffle of cool prizes! Like a free pass to Plaza Premium Lounge at Galeão Airport, among others! Enough reasons to come for meeting and making friends in one of Rio's most sophisticated hotels!